Let’s start with the fact that you were voted one of The Greatest Canadians of all time. What do you think you represent to Canadians? I’ve been one of the most popular and I think that’s what it was; and I think it was a statement by the working class guys, which I am, the blue collar guys, that you don’t have to be college educated, you don’t have to be a superstar to be a great Canadian guy. They really don’t think I’m the greatest Canadian, they just want to make a statement about the blue collar guy and that’s what I believe they did. Agreed! What are your favourite things about being Canadian? First of all, being Canadian – I go back to – we’ve been in the country now for about 200 years, and some of the things I see now in Canada I’m not too proud of. The working class guy goes to church, pays his taxes, works all day, he’s the silent majority that never has a voice. I’m not too proud of that. Having said all that, Canada is the greatest nation in the world because everybody in the world wants to come here. It bothers me when people that come over don’t believe Canada is number one and I believe if you don’t think Canada is number one and you don’t love Canada above everything, you should go back to where you came from. Do you remember at what age and the circumstances around you wanting to be in the NHL? I was about four years old when I first started to think about it. The story I told one time was that I got down on my knees every night and I prayed, “Please make me a professional hockey player”, but unfortunately I didn’t say, “in the NHL” and I spent 16 years in the minors (laughs). You have to be very specific! The Lord wants you to be specific. It’s true. Did you share your goal with anyone? Every young boy back then wanted to be a hockey player. I wanted to be a hockey player so much that I never paid attention to homework; I never paid attention in school. I paid for that later. I was too dedicated to make it in professional hockey but everyone back then wanted to make it. Is there anyone in particular that helped you achieve it? My dad, and my mother too – when I went away to play in the Juniors we played for a very tight and cheap owner and what happened was the very first time my mother ever saw me play, I had old gloves with holes in them and I remember she went out and bought these expensive gloves for me and I was the only boy on the team that had new gloves. It was encouragement like that. I’ll tell a story later about how my father encouraged me. I think I read somewhere that you have a bit of Irish background and so do I. So I’m going to ask, who was more fiery, your mom or your dad? My mother was more fiery, I have to say that, but my father was like a lion but my mother was more fiery. So I get the gift of the gab or whatever I have from my mother. My family does come from Ireland, the name Cherry comes from County Cork. I was wondering if you consider your outspoken nature to be genetic or were you taught that it’s OK to be exactly who you are without apology? I think we were very fortunate. What I think my mother taught mostly is manners and honesty. It’s not really outspokenness, it’s being honest. We were taught never to lie. For instance, I was very, very bad at school and all my friends and most people in the world play hooky at least one day. I never ever did even when my friends were doing it once in a while. The way it was in my mind, whether right or wrong, when I left home my mother thought I was going to school and if I didn’t go to school that means I was lying to my mother. I know I didn’t do much when I went there… but I was always there. I never missed one day playing hooky. It’s not outspokenness. I think it’s being honest. Someone asks you a question and you got to be ready for the answer and it’s got to be an honest answer. You included a beautiful quote by Theodore Roosevelt in your book Hockey Stories and Stuff and I’m going to print it in the article because I want other people to read it too. It’s really beautiful. The quote includes a line about, “the cold and the timid souls who know neither victory nor defeat” because they never try. I know your dad pulled you aside and read you that passage before you went to play in the Juniors, but when did you start applying that philosophy? That’s great advice. I remember reading in your book about the “drinking episode” and how the thought of having to go back to your parents and tell them you were involved in it, would have been heartbreaking. They really did some great character development because it was your own internal barometer there saying, “Oh, my gosh, if I go home now…” But I’m wondering from your standpoint, what’s your favourite childhood memory? That’s a perfect example that you mentioned there of honesty because sometimes honesty comes back to bite you. And I was honest and my coaches asked me if I ever had a beer and I think I had one, one time and I had to say “yes”. There isn’t one of the other guys who stood up for the guys. But honesty always pays. In the end I think they got more from me because I was honest. When I think back to my childhood, the thing that I remember the most and think fondly back on is when my dad used to read to my brother and I every night. He used to read Horatio Alger, you know who he is, right? There are a hundred and fifty books and every book starts the same. The boy starts off kind of tough in life, he’s honest, courageous, gets knocked down, he fights back and in the end he always wins. Every night we’d get a chapter read to us. Something like that, when you hear it every night, every night, it helped me when I was having a tough time later in life when I was unemployed and down and out. I always thought back to my dad reading me passages from Horatio Alger. CBC wanted to fire you in your first month of Hockey Night in Canada in an effort “to protect” the English speaking children of Canada. How did you initially respond to the criticism about how you spoke on air and how would you handle a similar situation now? Well it was funny, Ralph Mellanby at the network, the Executive Producer said, “Yeah it’s true, Canada is a country of two official languages and Don speaks neither one of them.” (Laughs). I didn’t understand then the reason about it because naturally everybody at CBC when they’re in broadcasting they have to go to school. Most of them have gone to college and I was one of the first guys to walk in with a working class vocabulary. I got my vocabulary when I was a kid. Every summer I worked with Irish and Scottish workers from the old country so I picked up the way they talked from working with them day after day. I have a friend who’s the same age as me and he did the same thing and he talks exactly like me. We’re the only two people in the world who talk like this, him and I. You pick up all the little inflections of the construction Irish people. Do you think heart and passion for what a person pursues determines whether they’re successful or not or is it more about talent and skill? I think it’s the old story we’ve always had how hard work will beat talent every time, but fortunately sometimes you have guys who have hard work and talent like Bobby Orr and Gretzky. That’s a great combination but if you have a guy who’s ordinary and has a lot of talent and another guy who works hard, the hardworking man will always win. What NHL player plays with the most passion? I know I should say Sydney Crosby, or Eric Staal, or Ovechkin. I admire them all for their passion and dedication, but I’m going to say, a player who plays on defence for the worst team in the league, Brendan Witt. And I know all your readers are going to say, “Who?” He’s a defence man who has been in the league for over ten years. He gives it everything he has, for a last place club. It’s easy to play with passion when you’re on a winning team or playing for the Stanley Cup, but Witt plays with passion every game. He comes out every game, he never quits, he blocks shots, he fights, and he scores goals. This is how I judge men: Witt was losing 3-0, with eight minutes to go, he had an awful cut on his face, he went in and got stitched, there was no way they could have scored any goals, it’s the worst team in the league, yet who comes back on the bench? He does. I mean he could have bailed, 99.9% of people would have said, “Hey, it’s 3-0, I’m all cut up here, what am I gonna’ do?” But nope, there he is, back on the bench for the worst team in the league in a 3-0 loss. Brendan Witt…in my books, he’s the one that plays with passion, he’s my type of guy. What charities do you hold close to your heart and why have you chosen to get involved in them? I have the Rose Cherry’s Home for Kids in Milton – I give all the credit to my daughter. It’s for kids that are terminally ill. The kids are there with doctors and nurses but it’s actually for the parents so that they can go away for a week or so. You have to realize the parents of these kids take care of them day after day after day and they don’t get a break. So, having a place to go in the middle of the woods on 77 acres gives them a break. It’s just wonderful. The government was good, they helped us, but my daughter raised the money and she’s the one that deserves all the credit. I also have to say the Kidney Foundation because my son had a kidney transplant and they were just wonderful so I support all the organ transplants especially in the kidney department. I’m going to try and ask this question without crying because it’s still a little fresh for me. You and I have both suffered heartbreaking loss and I was certain I would never feel passion for anything again, in fact I never thought I’d be happy again. How did you find the courage to find meaning in life after Rose passed away and what was that process like for you? It relates to passion for me because I really thought I would never find that fire in my belly again or the spark in my eye, but I managed to and it took time and I wondered what your process was like? I think that your article with your daughter was inspiring. In fact it inspired me to write something. (Summer 2009 Issue) I don’t know, I think I did let go a little, for about eight months – I was not into the world, I really didn’t care whether I got fired, I went over to the Olympics and did things – I was so ticked off with the world. I was not sad, I was bitter. This day I’m sort of bitter too, I must admit. The old story, you have to work it out, gradually, you never forget, you kind of work it out. I got working an awful lot to get it done. I don’t know how I did it but I know for about eight months I wasn’t clicking in all corners. What did Blue teach you most about life? My first Blue was absolutely beautiful. She never ever went looking for a fight and she never meant little dogs harm, but boy, she was always ready. I got her with the Boston Bruins offer. She never picked on smaller dogs, she never picked on anybody. When she came, I could give you a hundred stories about her. The courage she showed was unbelievable. She was the apple of my eye I tell you. I had her for 14 years. The only picture I have of anybody in my kitchen is of her. Was she named after Labatt’s Blue or how was she named? You’ve been awarded the National Hockey League Coach of the Year and Coach of the Year honours from the American Hockey League. What makes an outstanding coach in your opinion? Well, you have to relate to players and whoever gives the most – not the guy that wins the most championships is the Coach of the Year. It’s the coach that gets the most out of his players with the players he has. Show me a good coach and he’s got a good goalie. Anybody can get off when you have some of the line up guys. It’s the problem guys that you have to straighten out. If you were coaching Sean Avery, how would you handle him? I think the way he was handled this year. He’s playing the game, not acting like an idiot, and he’s an effective hockey player. I don’t know how long it will last. The sad thing about it is he’s a good hockey player and he hurt himself in many ways with what he did. I’d handle him the way John Tortorella has handled him. He’s a good hockey player. You refer to Wayne Gretzky as the best salesman in the NHL and I think one of things you’ve done so brilliantly, is market the game, teaching people how wonderful it is. What’s your take on him right now and what he’s going through? 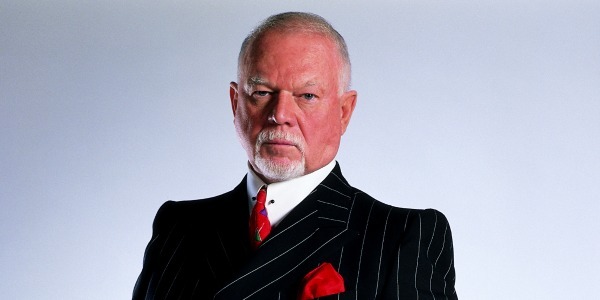 It’s too bad that a guy who did so much for the National Hockey League has had his reputation tarnished a bit by people. I don’t understand it. I wish he hadn’t gone out and started the press, it’s sad because he’s always been there for interviews for everybody. He’s like Crosby but only Wayne was even better than that. It’s sad to see the situation he’s in now, but if I know Wayne Gretzky, he’ll come out smelling like roses. He’ll have a plan, there’s no doubt about it. I hope so because he’s a good guy. You calculated that Mats Sundin made $6,100 a minute in the 2007-08 season. Do you think the money was justified? What year was that, the last year he played? He was worth it earlier but that was Vancouver and I’ll give it the old try but nobody, very rarely do you get a great 37 year old come in after missing four months of the season. I think they played pretty good for a little bit. He did the right thing retiring. He could come back and have another $4 or $5 million bucks but at least he had the integrity to retire. There was a time when you didn’t make enough money to buy furniture for the places you were living in. Now that your financial situation has improved tremendously, do you believe money can buy happiness? Yes, I do. I hate to hear these people that say, “Oh, money’s not everything”. Wait until you’re broke and see how money doesn’t buy everything. Of course health is the most important thing. Money can buy happiness, there’s no doubt about it. How do you feel about the chatter about teams moving back to Canada? Eventually it’s going to happen. Eventually there will be a team in Winnipeg for sure and there will be a team around Hamilton. I don’t know whether it will be in Hamilton but it should be. We will be able see two or three more teams in Canada within the next 10 years. If you were Commissioner for the day, what would you do to improve the game? I’d start by taking out the instigating rule. The problem is that if you start a fight, you get 2 minutes, 5 minutes, and a game misconduct which is 17 minutes. A lot of people will say, yeah, you just want more fighting and that’s exactly what I’d put in. McSorley was there to protect the stars. They never touched Gretzky. He never ever touched him. He had a credit card to play out there and nobody hurt him. The same thing was with the New York Islanders when Bobby was there. They had two good players called Clark Gillies and Bobby Nystrom and they protected Bobby. And that’s the way it should be. The players should be protected. Stars should have been protected but now you can’t protect them. It’s open season and you see the stars hurt all the time and it’s because people don’t help them and protect them and you get an instigator penalty for 5 or 10. So that’s the first thing I’d take out. Second thing, I’d take out the silly touch icing rule. There have been more players hurt and retired for touch icing than any other play in hockey. And thirdly, I’d take out that silly flipping the puck over the boards is a two minute delay in the game. Those are the three things that I’d do. Other than that, when you go back to last year’s playoffs, I’m not saying it was the best hockey in the world, but I’d say it was the most exciting playoffs I’ve seen and I’ve been covering them for 30 years and I’d say that those games with Pittsburgh and Detroit, Philadelphia and Pittsburgh and down the line, all those seven games, were unbelievable. Is there something specific you still want to accomplish? I don’t think you’ll ever retire. I think you’ll always be around the game. What I’d like to do and I know I’d probably never be able to do it – I’d like to go live on the radio and pick up a newspaper cold and give my thoughts on the articles in the paper and the things that have happened from 7:00 to about 9:00 o’clock. I’d like to do that but I’d never do it because I don’t have time to. I often think I’d like to pick up the paper and read about something that happened in the city or the government. I’d love to do that and I’d like to do it live and do it cold before I prepare. I think it’d be dynamite. I think so too! It’d be fantastic! You’d have to have your lawyers ready. Totally! I totally think you should do it. There’s still time! I don’t have time but I’d love to if I ever did have the time, I think it would be a lot of fun. What’s the greatest advice you can give someone to help them realize their dreams? I love that quote. Let’s end with that.